Does your dog Bite, Bark, Dig, Disobey, Chew, Chase, Fight or Freak you Out! 2) Globally: Pam's Natural Dog Training Home Kits work just as well! Pam's Natural Dog Training methods are not a new fad or a passing gimmick. 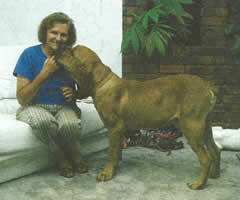 Pam has been using Natural Dog Training on both grown dogs and puppies extremely successfully for 4 decades in many countries extremely successfully. In fact, dogs have been using these natural communication techniques for countless thousands of years. Also very s+'uccessfully. Natural Dog Training is older than history, yet newer than tomorrow. It works so well that you see major results in the first session! "I thought you'd like to hear that Spike our pet Staffie who you so successfully rehabilitated with Natural Dog Training is still going strong at 14 yrs old. He never gave us a moment's trouble after you sorted him out that day you spent with us. This is just to let you know that I am so grateful to you for saving our pet's life ... Yours, Jill." The wonderful news is - you do not need Pam to be personally present to train your dog the Natural Way! Her Natural Dog Training Home Kit will do it for you! "My wife & I have already commenced your program & the results are showing within one day - thank you for your years of experience & expertise." "We achieved my goal of a fight-free weekend; in fact the two fighting dogs were actually sleeping quite happily in the same dog bed this morning!" "10 Years back you helped solve my pet Bull Terriers tail chasing - I'm glad to share with you he died of old age a few months back as opposed to the vet's recommendation of having him put down." The Intelligent Alternative - Nature Knows Best! Click here to see how well Pam Whyte's Natural Dog Training Home Kits work..